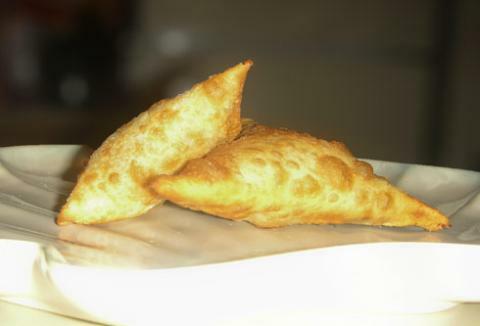 Somali Sambusa is a stuffed triangular pastries that are very popular appetizers served not only during Ramadan, but any on occasion as an appetizer, they come with all kinds of fillings. Cook the meat in a skillet with a little oil on a medium heat. Let the filling cool at room temperature. In a small bowl, mix flour and the water to make a smooth paste. Pick one the sambusa wrappers with your hands and fold it into a cone shape seal it with flour paste. Fill the cone with the filling and close the top into a triangle shape and seal it with the flour paste. Pinch the edges so that it is completely sealed. Continue filling the rest of the sambusas. Heat the oil in frying pan, fry the sambusas until golden brown.